Our Draft Plan has now been sent to the Council by the HNF Chairman Mike Ratcliffe. This is a preliminary draft for comment by the City Planning Department prior to formal submission. The Steering Committee (SC) approved this draft after considering feedback from statutory bodies and making amendments that agrees with the sense of policy direction from our consultation and meet, where possible, the views of those bodies. There remain, at a time of change within national planning policy frameworks, areas which may be fluid over the next period, but the SC believe that this draft plan reflects the views of those who the SC has extensively consulted. The SC is grateful for the informal feedback it has received from the City Council and look forward to the next stage of formal engagement with the City as the plan progresses. Feedback on Character Assessments available here. We had completed the consultation and policy formation phases – whereby we have taken the views of people who live, work and study in Headington to shape a plan with policies to meet our vision and objectives – before Christmas. We are now in a phase of formal consultation with organisations specified in law as requiring an engagement. These include bodies such as Natural England and Thames Water and also some, such as Oxford University Hospitals Trust, who have had an engagement already (thankfully it was decided that we could skip the marine management organisation and the coal authority). At the same time we have been engaging with the City Council, who, as the planning authority, are responsible for ensuring we follow the process, but who are also the owners of many of the local policies we are working with. We are, therefore, collating comments from these various groups and the Steering Committee’s job is to maintain, wherever possible, the ideas that everyone had balancing that with what we are allowed to do. Much of the feedback has been really useful, helping us to shape what we have proposed in a way that it can be implemented. In a couple of areas it’s clear there are points of difference, and we will be going to the Forum to confirm what to do – should we stick with the policy or alter it? We’ll put the plan version that goes out to the Forum on our website, and then put up our last internal version after the Forum signs it off. These consultative phases are important, but also a bit behind the scenes, so it might look like not much is going on. There will be a City Council consultation, consideration by the Executive Board, then an inspection and finally a referendum – so no one will be short of an opportunity to engage with the plan. The consultation is now completed. Many thanks to all the many people who took part. The Steering Committee have analysed the feedback and held discussions with interested parties in order to amend the Draft Plan. The results were brought to the Forum Annual General Meeting on October 2nd. The Headington Neighbourhood Forum’s Draft Plan was published on Sunday 31 May 2015. It can be viewed and discussed at the Headington Hub (125 London Road) on the next six Saturdays, 10 am to 4 pm (until July 11th). The Character Assessments of Headington done in conjunction with the Draft Plan can be found here. The Headington Neighbourhood Forum’s Draft Plan was published on Sunday 31 May 2015. It can be viewed on the Forum’s stand at the Headington Festival and on the Draft Plan webpage. The next Forum Meeting on 27th April 2015 will consider the draft plan previously circulated to Forum members by email. The next Forum Meeting Tuesday 10th February 2015 in the Board Room, Oxford Brookes University. See the POSTER. 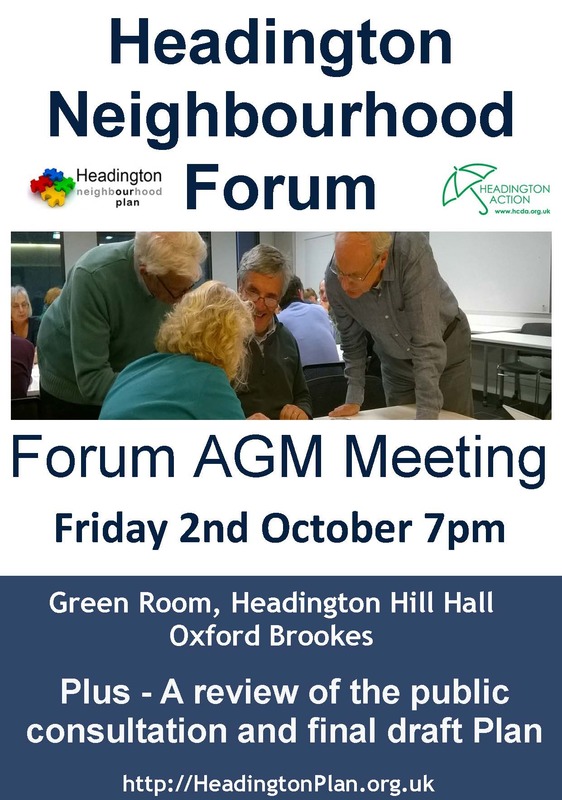 The Headington Neighbourhood Forum carried out a consultation with residents and other stakeholders in Headington over the summer of 2014. The consultation was designed to offer suggestions on the important issues affecting Headington and to ask for respondents’ views. The consultation took the form of a leaflet, distributed to homes in Headington, and was also available on this website and as an online survey. The Results of the Consultation are now available on the Consultation 2014 page of this website. The Forum’s six Policy Working Groups took part in a workshop on Nov. 29th to consider the outcomes of the recent Consultation and to plan the next steps in developing the Neighbourhood Plan. Oxford Brookes University students from the Department of Planning are again supporting the development of the Headington Neighbourhood Plan as part of their final year degree work. Six groups of students are investigating different aspects of the plan in support of the Policy Working Groups for Amenities & Green Spaces, Character & Identity, Housing, Retail & Business, and Transport. The AGM (1st October 2014) elected a Steering Committee to continue the work of the interim Steering Group. The presentation made at the AGM on traffic congestion, volume of traffic, commuting to work in Headington, etc. is available to view here. The Forum’s consultation with residents, workers and students in Headington has now finished. Results will be analysed and published in the next few weeks (Posted: 06/11/2014). 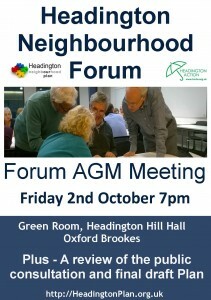 Forum AGM 1st October 2014, Headington Baptist Church Hall, 7:30 pm. The Headington Neighbourhood Forum is conducting a postal and online survey to find out your views on the important issues affecting Headington. Go to the Consultation page to find out more.